On New Year’s Eve in Phoenix, a giant tortilla chip will fall into an equally giant jar of salsa to usher in 2012. Less than 48 hours later, something much more momentous will fall in Phoenix: Andrew Luck’s final college pass. The Greater Phoenix Convention & Visitors Bureau expects thousands of Stanford football fans to witness both events. Luck, the presumptive No. 1 pick in next season’s NFL draft, will play in his final college game Jan. 2 at University of Phoenix Stadium when he leads No.4-ranked Stanford against No. 3-ranked Oklahoma State in the 2012 Fiesta Bowl. The game will feature two of the NCAA’s most prolific offenses (the Cardinal average 43.5 points and 481 yards per game compared to the Cowboys’ 49.3 points and 557 yards) and showcase two of the nation’s best quarterbacks in Luck and 28-year-old Brandon Weeden of Oklahoma State. Stanford has traveled frequently to Greater Phoenix to play Pac-12 foe Arizona State, but the Cardinal are making their first appearance in the Fiesta Bowl. A year ago, Stanford dominated Virginia Tech in the Orange Bowl—but Cardinal fans didn’t travel in strong numbers to Florida. Scott Dunn, a spokesperson for the Greater Phoenix CVB, expects this year to be different. According to Phoenix Sky Harbor International Airport, there are more than 50 nonstop flights a day to Phoenix from Bay Area airports (San Francisco, Oakland and San Jose), and the fare for most is less than $250. Oklahoma’s airline hubs can’t compete with that volume, but Southwest Airlines has added flights between Phoenix and Oklahoma to accommodate the expected influx of Oklahoma State fans. Fiesta Bowl officials predict the Fiesta Bowl and its sister bowl, the Insight Bowl, will bring $200 million in economic impact to the region. According to the Fiesta Bowl website, more than 3 million out-of-state visitors travel to Arizona for the game and its related events each year. When picking a restaurant in Greater Phoenix, consider a dining room with a view. Many restaurants feature open-air patios where you can watch a postcard-perfect sunset or dine beneath desert stars. Among the restaurants with the best winter patios (and creative cuisine) are Bourbon Steak, Café Bink, Cibo, El Chorro, Elements, Kai, Lon’s and Talavera. 4. Ring in the New Year on Mill Avenue. • Heard Museum provides fascinating insights into the culture and history of Arizona’s 22 Native American tribes. It features both traditional and contemporary works, including what is perhaps the world’s greatest collection of Kachina dolls. A tip for visitors in search of meaningful souvenirs: The Heard Museum Shop is one of best places in Phoenix to buy authentic American Indian jewelry and art. • Desert Botanical Garden is a 50-acre outdoor museum that showcases endangered desert species from around the world, including Dali-esque trees from North Africa and sprawling cactuses from Mesopotamia. Through Dec. 30 visitors can purchase tickets to Las Noches de las Luminarias, a Phoenix Christmas tradition in which the garden paths are lined with more than 8,000 hand-lit luminarias. • If kids designed a museum, it would look like Children’s Museum of Phoenix. This indoor playground features a hanging forest made of foam swimming noodles, a miniature grocery store with scanners and box-filled aisles, and a wooden racecar track that would tickle the fancy of M.C. Esher. And you can touch everything. Wherever you stay in Greater Phoenix, you’re not far from a park or preserve. On the city’s southern frontier is South Mountain Park and Preserve, the largest municipal park in the nation. The park is crisscrossed by more than 50 miles of trails and occupies 16,000 acres, making it 19 times bigger than New York’s Central Park. (There’s also a paved road to South Mountain’s summit, so motorists can enjoy the bird’s-eye view.) Other easily accessible spots for outdoors pursuits are Phoenix Mountains Park and Camelback Mountain. 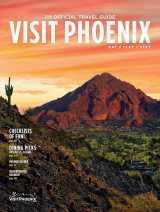 The latter, Phoenix’s most famous natural landmark, challenges hikers with a rugged trek to its 2,700-foot peak. Phoenix is the gateway to America’s most iconic natural landmark: the Grand Canyon. It’s a 3½ to 4-hour drive to the South Rim, depending on how many scenic stops you make (and there are plenty, with the red rocks of Sedona being a favorite). True wintry weather awaits at the Grand Canyon’s higher elevation, and you might be lucky enough to see this national treasure covered in snow.